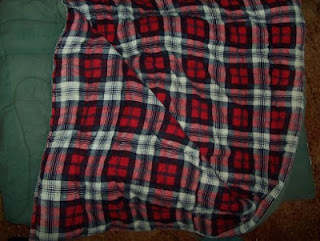 I just brought home a very old sleeping bag from my mom's house that I remember from my childhood. It's 40+ years old, at least! It was in the garage, up in the rafters, getting very dusty and musty. Seriously, it smelled so bad, I washed it, took it out, and washed it again after letting it soak for a couple of hours. 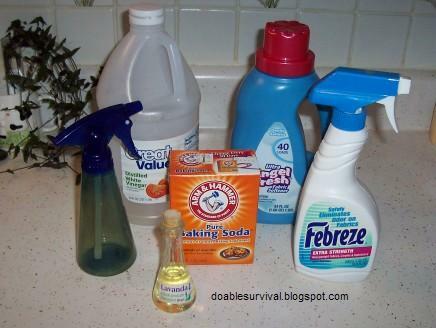 It still had a musty smell to it a little bit, so I thought what better way to try the home-made Febreze. There are a lot of different versions, so pick the one you think you would like to try. There are too many for me to try them all; but I started out trying two of them (small batches). I'm not so sure about the ones with alcohol in them. I'm not sure if it is safe for all fabrics? I tried these first two recipes. I added lavender oil to both, 1/8 tsp. For the second one, I didn't like that I could still smell the vinegar after it dried [see update below]; so I like the first one best. I realized I wasn't crazy about the scent of the fabric softener I had and remembered I had made my own home-made fabric softener, so I did a third batch and used that; and that was my favorite one. I think the one with lemon juice probably smells good, but I don't associate lemon with fabric. I think of that as more of a kitchen thing. Add some lavender oil or other scent if you would like. Some people use up to 1/2 to 1 tsp. of it, but I thought 1/8 tsp. was enough. 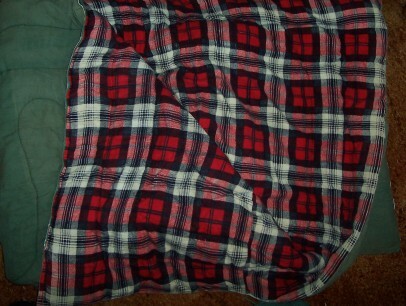 UPDATE: It's the day after I sprayed my old sleeping bag, and the area where I sprayed the vinegar recipe smells good. I don't smell the vinegar anymore so I like that recipe as well. Actually, I think it did better in the long run than the baking soda one! Please feel free to leave a comment, tip, or suggestion below.